Shopping for Video Games Statues? "I cannot ignore your evil deeds." Taki is the second statue in the Soul Calibur IIseries! This highly detailed statue stands 19 1/2-inches tall! 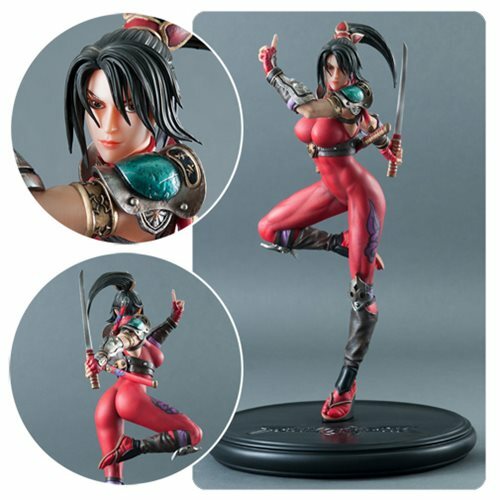 From the video game series, Soul Calibur II, comes this Soul Calibur II Taki Statue. Featuring the demon huntress Taki, this statue displays expert craftsmanship. Highly detailed, this statue faithfully captures her strength and look from the game. This stunning statue measures approximately 19 1/2-inches tall x 12-inches wide x 12-inches deep. It comes with a highly detailed base, with the game title, one headsculpt, one die-cast sword, and an authentication card.